Relaxing large porch and living room for family, friends and cocktails, off-street parking for up to four vehicles. Five air-conditioned bedrooms, Cable/Wi-Fi, barbeque grill, outdoor shower, beach chairs and towels, laundry. We are year-round residents of Martha's Vineyard, residing in West Tisbury, a fifteen minute drive to East Chop. This historic house has been in our family for over one hundred years. It was originally the East Chop Yacht Club House, and was moved to the present sight by ox-drawn trolley in the early 1900's. Periodic renovations have preserved the original character while ensuring safety updates. We are here, should you need us for any reason, including knowledge of the island and its current events, locals tips, etc. This very special neighborhood of East Chop has been a favorite for generations of families who return every year. Rich in history, surrounded by the sea, close to everything yet just far enough away from the town to have a unique and relaxed vibe. 10 minute walk to the beach, another 10 to get to town on foot. You can catch the bus at the end of the road to get to any of the towns on the island. The buses are bike friendly, which you can rent in Oak Bluffs, or bring your own. Relaxation and exploring our unique island. outdoor shower, updated outdoor private shower. 2 full baths, Main floor is modern bath/shower stall. Second floor bath has vintage clawfoot tub with shower enclosure. A pleasant 1/3 mi. walk away. Great food and good times. East Chop is a great place for morning walks and early evening get-togethers. While being friendly and respectful of privacy, this neighborhood is a wonderful place to start your day. Walk to Harbor. Walk 9 min to ECBC and Jetty Public Beach. Walk 5 min to Sunset Lake. Walk 5 min to the bluffs. Local calls only. Please use cellphones for long distance. Master Bedroom Air conditioning in general on the Vineyard, I feel, is rather counter-intuitive. With the exception of a rare very foggy night, the open air breezes through a house in mostly shade is very comfortable. Fully furnished for food prep. Large flatscreen in living room. Small flatscreen in Master bedroom. 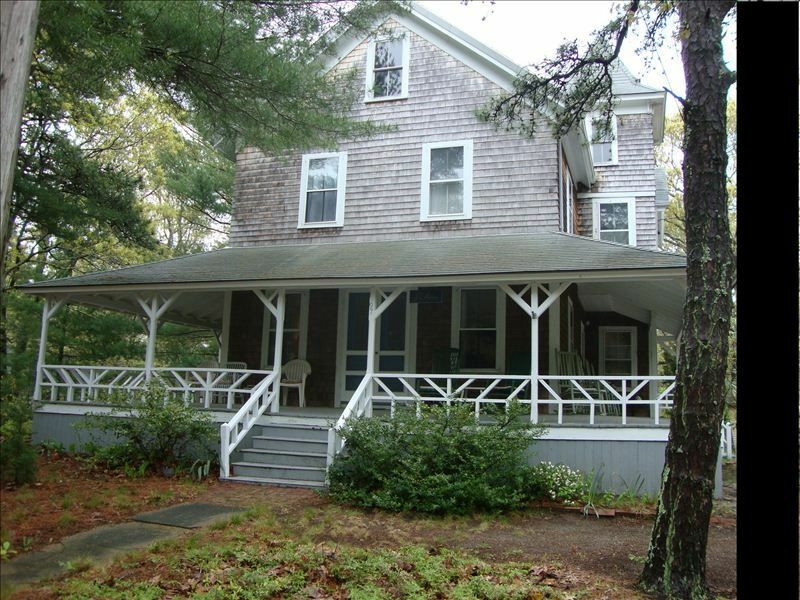 Enclosed private outdoor shower, historic Vineyard book collection, plenty of porch rockers and tables, full laundry, downstairs Master bedroom, Walk to Town, Beach, Tabernacle, Fireworks, Illumination Night. Planned an all girls outing to the Vineyard in August and was very happy with this property. The house is very clean and well maintained. The decor of the home is very country-chic and overall comfortable. Initially we were worried about the distance of the house from town, but it turned out to be a non-issue. Downtown Oak Bluffs is about a 15 - 20 minute walk away and it was great getting our daily exercise by either walking or biking. The East Chop lighthouse is 5 minutes away, which was nice to pass on our bike rides to Vineyard Haven. Overall, I would recommend this property and look forward to staying here again in the future. Picture this: A beautiful quiet morning with coffee or tea on the porch, perhaps a stroll to the bluff overlooking the ocean view of 180 degrees, just a two block walk straight up Munroe Av. to East Chop Drive. From here you can continue to the path leading to the public beach which has a jetty on the end, which is a big hit with kids who can discover crabs, clams and assorted wildlife. Look above for the Ospreys nesting just behind you high in their pole nest. Pack your lunch and beverages. For a quicker trip to and from the house, bicycles can be rented nearby, or bring your own. Town is just another five minutes away with much shopping, eateries, music, and activities. Take the kids on a fishing charter aboard the Skipper, a kid-friendly operation located right in Oak Bluffs harbor. From here you can also ride the walk-on ferries to Nantucket and Hyannis as well as Falmouth. The public beaches beyond this point are expansive and extend out headed towards State Beach in Edgartown. 50% deposit is required to secure your reservation. Balance, including refundable damage deposit, is due thirty days prior to arrival.